Panic gripped Shivpuri’s Chintaharan Colony after a crocodile from nearby Bhujaria Talab entered the residential area, on Tuesday morning. Though the residents informed forest officials, the alleged sluggish response from the rescue team made them take action. After a prolonged struggle, they managed to tie the around five-and-a-half feet long reptile, with wooden logs and ropes. Enraged over the delayed response, residents carried the crocodile to the chief conservator of forests (CCF) RD Sankhwar, and released it within his bungalow premises. 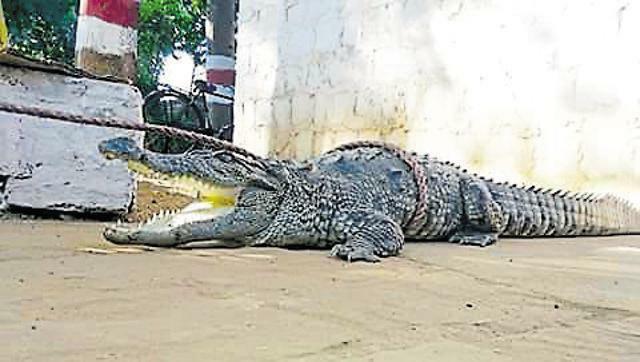 Guards posted at the bungalow tied the crocodile, which was later released in Sindh river, about 40km from Shivpuri. Shivpuri, the summer capital of erstwhile Scindia rulers, is surrounded by water bodies, which is home to a large number of crocodiles. Meanwhile councilor of ward no 28 Hariohm Narwaria said the crocodiles entering residential areas surrounded by ponds and nullahs etc was a common phenomenon. The danger of man-animal conflict looms large and the rescue teams of forest department don’t act fast, added Narwari. According to information Shivpuri is surrounded by water bodies including Sakhya Sagar or Chand-Pata Talab (made-made lake) on city’s upper stream. Two pairs of crocodiles from the crocodile park in Chennai were brought and released in the lake in 1978. Now the lake is reportedly over-populated with estimates figure of 500 plus crocodiles in Chand Pata lake posing danger of man-animal conflict. As it can survive both in water and land mass, crocodiles conveniently crossover the land mass to enter residential areas through down-stream nullahs or ponds. Residential areas situated on city’s outer periphery and cluster area of Chan-Pata are more prone to these incidents.